The Profase testimonials just keep coming in proving the product works for yeast infections, especially when combined with Biofase. I have struggled with horrendous burping for a couple of years. I would burp for hours on end, resulting in acid in my esophagus and therefore strictures. At one point I was restricted to liquids only due to the strictures. I tried different diets like FODMAP and GAPS but they never cured the condition. I was at the end of my rope since I have to eat to live but eating caused all the problems and brought me to the place where I could barely swallow food. I started on your anti candida diet, cutting out all fruit except 1/2 green apple a day and started on Profase, Biofase, probiotics, kefir, GSE and SF722. The results are incredible!! While I previously had terrible stomach bloating with nausea all morning and during the night, after only a few weeks on your program, I am down to almost no bloating and burping anymore. I am not up to the full strength on these enzymes and herbals yet, so as I continue, I am sure this is going to take care of the problem. Thank you so much for your website and all the information. You are really a lifesaver! Your systemic yeast regimen has been helping me tremendously! I have tried countless supplements and nothing has worked but biofase and profase along with the diet and the antifungals you recommend have been making a noticeable difference and I am finally seeing results. Thank you so much! Four months ago, my very healthy AND active 85 year old mom hit her head while gardening. The resulting blow caused a LARGE sub dural hematoma which was about 24 hours away from killing her AND necessitated emergency brain surgery in November. She made it through surgery easily but the resulting drugs and antibiotics took a toll on her formerly good health. During the recuperation phase, mom developed a pneumonia-like cough, a terribly itchy rash all over her legs, nausea, vomiting, fever, urinary tract infection, severe hearing loss due to eustachian tube inflammation and painful gas, bloating, constipation, insomnia and serious fatigue. So, needless to say, she was in a a real health crisis after her LIFE-SAVING surgery. 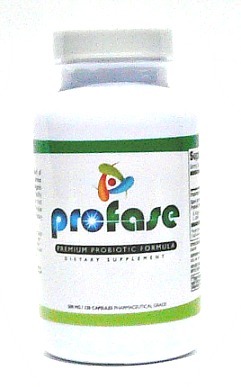 While searching for high quality and high powered Probiotics, I found her Biofase and Profase. So, she started with only 1 capsule each of Biofase and Profase daily for 4 days, and when things slightly improved, she doubled her intake to 1 of each, 2x per day and now she is on 3 per day which is not a lot but she wanted to go slowly and not cause a healing crisis. With so many months of NOT feeling good, I can understand why she wanted to go at a snail’s pace. After only 2.5 weeks of taking these 2 products, her rash is gone, her hearing is getting to be so good, she often doesn’t even put in her hearing aids, the deep cough is almost gone, she is sleeping 7-8 hours straight through the night, and the terrible stomach/intestinal issues are incredibly better plus the fatigue that she was feeling after eating and all afternoon is gone. I think it might take a month or two to help her intestinal flora re-establish itself since she is not taking high volumes of the products but I feel so confidant that it WILL do the job, I can’t wait to start taking BOTH of these products myself so I can keep up with my “once more youthful” mother. Since two years ago, I had intermittent chronic diarrhea with occasional bouts of constipation. The diarrhea would go on and on for about 25 days in a row followed by several days of constipation. This condition went on for about two years. I also kept losing weight.. approximately 3 pounds every month throughout the following year. As a result, I barely weighed 90 lbs and was quite underweight for my height. There was a point six months ago, I decided to stop weighing myself on any scale. To make things worst, none of my doctors knew how to turn my situation around. I've gone to at least four doctors, none of whom, helped much to alleviate this worsening condition. I, then set out to read everything I could find from functional medicine doctors online, listening to webinars, reading and googling countless pages on allergies, gluten sensitivity, fungus, candida, heavy metals toxicity, and many others. In December 2014, I was in GT5 health protocol but that didn't work out for me either due to lack of customer service communication and follow-up. At this point, I was at a loss on what to do next. The one thing that was a positive for me was the GT5 community in FB that I was apart of. One of the GT5 members suggested the Yeast Infection Advisor.com as an additional resource. I took the suggestion seriously, read countless pages on the website and have been following the Candida Yeast Program for almost two months now. Taking the potent Biofase enzymes and Profase probiotics daily has transformed my digestive tract functions and likewise, was instrumental in stopping chronic diarrhea once and for all! Additionally, Dan is excellent in communication! I have never been more impressed before by the speed at which he answered questions by email, I started to sleep better, the diarrhea has stopped and have gained a few pounds this month per my annual physical exam! Also, I have a general feeling that I'm on the right road to wellness with Dan being very supportive and ready to help any day of the week. I am currently on Rotation 2 of this program and I have nothing but praises for Biofase enzymes, Profase probiotics and how well Dan treats his customers! Customer Services is excellent! Thank you so much for the opportunity to know you and your Candida Cleanse program! Just have to say Thank you! Before using your biofase and profase and boric acid with coconut oil and sf722, my daughter was suffering greatly with candida glabrata, your advise and your products are a Godsend! She is able to function again, she has her energy back, her all over health has improved greatly! I'm so thankful to have found you, and your probiotics and enzymes! I have been using the Biofase & Profase for almost a month now, along side taking grapefruit seed extract and cinnamon tablets as suggested on website. One thing I am really impressed with is there is no after taste or bloasting with Bio&Profase. I tired the health food probiatics for a month after my antibiotics, it didn't do a thing and felt bloated. The balance of the program is making a difference because I am seeing and feeling I am winning the battle. I have been using the cinnamon, oregano oils topically alternating oils using coconut oil as a base also the Bio&Profase mixture on tongue. I know it works because whatever I target on my skin and month it gets mad and moves somewhere else. I would of not known where to begin if it wasn't for the information on the website, which I am so grateful. Everything is working together like a well choreographed ballet with the Biofase & Profase being the principle dancers, every dancer is important tho. Staying on the program, including diet, is the balance that is making a difference. I wanted to say thank you as you have helped me greatly - I have been ill for some years without ever being helped to heal me by many practitioners. After reading your site and ordering biofase and profase - after just 2 weeks I am feeling much better. You also answered my questions rapidly when I emailed you. I am now in the process of my 2nd order - thank you so much for your work helping thousands of people. The Biofase and Profase cured the yeast within a week I had suffered with for 20 years. No product I've tried in those years did anything!!! I'm ordering again because I keep eating things with a lot of sugar that I couldn't enjoy before. And don't want it to come back. Also thanks to the lady that recommended coconut oil vaginal suppositories. It killed the vaginal yeast. Within 3 days. I am so happy I found the yeast infection advisor website! Despite working with a functional medicine doctor for over a year, I was still having bloating, acne, periodic single hive reactions, joint pain and weird sensations in my stomach. After following the diet, supplement recommendations and taking biofase and profase, my skin has improved, my stomach feels good and things are more regular. I have tried so many probiotics and enzymes and none have been as effective as these two products! I am so grateful to have found them and to be feeling that my health is improving! I developed a systemic yeast infection after my immune system was knocked down by a rash and cold. My doctors put me on prednisone for the rash, which caused the infection to spread to three sites in my body. I was put on a total of 36 days of Diflucan, but all it really did was keep the yeast from getting worse. I stumbled upon Dan’s website and started educating myself on systemic yeast. Whenever I had a question, I would email Dan and he would get right back to me. I can’t thank you enough for all your help, Dan. Once I decided to get serious about treating myself, I decided to get on the diet he recommends on his website and in his newsletter. Within about three days I started having die-off symptoms, which were unpleasant, but a welcome sign that the yeast was dying. 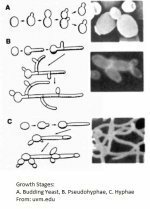 Dan was right that you can be on diflucan for a long time but if you continue to feed the yeast, it will continue to grow. So, I highly recommend anyone with a yeast problem to get on the diet. It is a rough road, but it is worth it. Also, look into supportive supplements to manage the die-off symptoms. I then decided to try Biofase with the probiotics that my naturopath’s office told me to use. After about four or 5 days, I started having the die-off symptoms again, which told me that the Biofase was indeed doing it’s job. About a week later, I decided to order Profase, because it is designed to kill yeast, and the 11-Strain probiotic, because it is supposed to help rashes. By using all three products, my yeast has really started to dissipate. I know this for two reasons. First, each time I increase the Biofase dose (which I am taking very slowly; I’m only taking two pills twice a day) I go through die-off symptoms for about a week. And second, my naturopath has a machine that “reads” your body to test supplements on me and then gives a score based on how badly I need each supplement. My numbers for the yeast products decreased dramatically after just over a week of adding Profase and 11-Strain to my treatment. I will mention that even though these probiotics are great and have many strains in them, there was one missing that my body “needed”. This means that even though I was on these probiotics, the scan was showing high numbers for the strain Saccharomyces. So, I added that in as well. My naturopath also put me on something to kill any yeast and bacteria that got into my bloodstream once they were free of their biofilm. So, if you are concerned about that, I recommend you try to find a naturopath or other alternative healthcare provider to help you out. I am confidant that with all of these changes I’ve made that my yeast problem is almost a thing of the past. Thank God! Of course, I will stay on the enzymes and probiotics for quite a while to make sure it doesn’t come back. Thank you for your website! It has helped me so much. The information that you've posted is so invaluable! Thank you for writing about mercury poisoning and it's connection to systemic yeast infection. I have gone through so much and several times I did not think that I was going to survive. I thank God that I have come across your website! Please tell others about the dangers of amalgam fillings. This was my case. That is why I have systemic yeast infection! I have tried several probiotics and enzymes, but none of them worked as well as your Profase, Biofase, and the 11 strain probiotics. I had severe digestion problems and the combination of all three, Profase, Biofase, and 11 strain probiotic actually worked! Thank you! My 12 year old daughter has been taking Profase, Biofase, and 11-strain Probiotics with your guidance just about one month now. You suggested she take one profase and one biofase in the morning and at night with no food for one hour after taking them. She also has been taking 11 strain pros about two hours after dinner. She takes 1 Colostrum tablet a day. She went through a detox phase for about a week in a half, with headaches, nausea, vomiting once, feeling sickish, but we gave/give her milk thistle to help remove the toxins and she is handling it well. Her diet has been extremely low carb with no sugars for seven years now, with small breaks here and there for special occasions, which usually led back to more adverse symptoms. We are hoping that her system has been and is experiencing true healing. She feels stronger now. We will never add in high sugars and carbs but we do hope to be able to add in healthy carbs and natural occurring sugars as in more vegetables and fruits, coconut flower and such. Currently her diet is very strict low carb, low sugar. I can never thank you enough for what you have given to my daughter, hope and healing! I have shared your website with friends who needed the info and may add this info to my blog site, and youtube channel. You are such a blessing. I will send a thank you donation via paypal. Thank you for saving my child. I have just received my 3rd bottles of BIOFASE and PROFASE. It was VERY HARD staying away from breads and sugars at first. But now I'm a firm believer in the PALEO diet. Being on these have REALLY helped me! I was in so much pain. NOT ANYMORE!!!! Before I found your amazing website, newsletter and yeast- infection enzymes and proboitics, I was on my own. I was using Candex and a very low dose probiotic with very unsatisfactory results until I found YIA and the products you make available. Once I started using the Biofase in conjunction with the Profase- I noticed a change is my symptoms almost overnight- My bloating and full- feeling subsided, my stomach pain is gone, and I am sleeping through the night. I continue to use Biofase in conjunction with your Custom Probiotics. I came to your invaluable information and yeast eliminating protocol well after I started the diet, and every day I continue to show progress and fewer symptoms of the evidence of yeast. And I feel pretty darn good! I am also down 21 lbs and completely changed my cholesterol profile! No more statin meds! frustrated,feeling miserable, and still struggling for relief. Thank you for your work, your guidance, your support and your Amazing Product line. I can only hope that anyone struggling with a yeast Infection finds your YIA site sooner rather than later. I started using Profase and Biofase about a month ago and now I no longer have stomach bloating, dizziness, brain fog and less muscle pain. My husband started using Biofase 2 weeks ago and he reports less intestinal distress and overall feeling better. This is the best and most effective product I have found for treating candida symptoms. I like the website information and how it lays out treatment plans. I have been recommending Biofase and Profase to friends, family and co-workers. Un grand merci pour ce site qui explique très bien l'infection aux candidats si dur a enlever et surtout un grand merci a vous qui répondez toujours aux questions. Votre protocole est de loin le meilleurs que j'ai utilisé et au jour d'aujourd'hui je peux dire que c'est le seul qui fonctionne vraiment. Le biofase + profase est très efficace contre cette levure. Je suis seulement a la deuxieme rotation du traitement et beaucoup de mes symptomes sont déjà parti. La route est longue sur le chemin de la guérison, et un grand merci de nous accompagner si efficacement. Ppour tous les francais ou francophone n'hesité pas a en parler a DAN et je vous recommande son protocole. A big thank you for this site that clearly explains infection candidates so hard to remove and especially a big thank you to you who always answer the questions. Your protocol is by far the best I've used, and as of today I can say that this is the only really works. The biofase + profase is very effective against this yeast. I'm only at the second rotation of the treatment and many of my symptoms are gone. The road is long on the road to recovery, and a big thank you to accompany us so effectively. For for all french speaking or not hesitated to talk to Dan and I recommend its protocol. I have been struggling with Candida for two and a half decades. I have tried just about every diet, routine, protocol, you name it all to no avail. Until now. I have been using a product that Dan developed, that breaks down the thick biofilm that accompanies the yeast colonies. It is an enzyme product called Biofase. It accompanies Profase another phenomenal product. When taken together they break up the film that allows that Profase probiotics to implant themselves in the intestine. Finally after years of suffering I am finally seeing a change in my health. What I find truly remarkable is how available Dan is when a question comes up. This is a person who not only understands the entire spectrum of Candida but is there at a moments notice to help. His website Yeastinfectionadvisor.com is chock full of information about the disease. I have researched for years and I have never seen anything that comes close to this. ears neck and scalp. They got so bad around my ears that it drew my scalp in and caused my hair to be misdirected in growth down into my face. Doctors have been confounded. I ran across your website one day and started reading and decided to give the Biofase and Profase a try. It is working! The problem is improving gradually because the hair caught in my ears makes it difficult to remove, but it is working! I am so very thankful that I found these amazing products and You, Dan, who have been so helpful. I'm delighted Dan to share with you that even at 81 my clarity has improved a lot since you directed me to biofase and profase. I also followed your advice on heavy metals, parasites and bad bacteria. I will rotate these protocols for the rest of my life. After the initial 3 months I do one of your protocols every week and a week off. If I forget or don't feel like it I let it go for another week. My mercury, arsenic, aluminum and lead levels are now 50% of the normal in usa. I am delighted with that. It was the heavy metal cleanse at the beginning of your protocol that I have been repeating many times over the last year. I do not have symptoms at all now but as ones body is always vulnerable I intend to keep at this forever. My chemical sensitivity and joint pains are much less. My digestion is great. Thanks a lot for being a genius. No amount of medical doctors at the cost of over $50 000 in the last 25 years has helped me more. Please put me on your newsletter list again as a lost most of your files with a computer glitch. I share your work with many and reread every now and then, thanks again. the most powerful guns to kill those nasty yeasts. After taking Biofase and Profase for 2 weeks, the yeast is gone. I have struggled with resistant candida for almost 2 years now and this was my last resort. I'm happy to say that I've found something that works! I realized I had candida when I developed persistent sores on my palms and shins. I had been treating bouts of IBS for years, on and off, and had been diagnosed with proctitis - the doctor I was seeing wanted to remove my lower colon and hook me up to a colostomy bag. I could treat the symptoms but found no relief until I tried Profase/Biofase. Coupled with the mercury cleans you promote, I am finally, after 20+ years of suffering, finding relief. Thank you for your kindness in sharing this information with others. If you would like to add your Profase testimonial feel free to send me an email through the contact page of this website.